Care of the Elderly Fellow at the University of Toronto in Ontario. Academic family physician and Assistant Professor at the University of Toronto and the physician lead of the South East Toronto Family Health Team. Physician lead for the PrimaryCare@Home Program at Taddle Creek Family Health Team, a psychotherapist and Medical Director of the Al & Malka Green Artists’ Health Centre at Toronto Western Hospital, an investigating coroner for the Province of Ontario, and Lecturer in the Department of Family and Community Medicine at the University of Toronto. Objective To assess the current landscape of home-based primary care (HBPC) or home visit training for Canadian family medicine residents. Setting Canada’s 17 family medicine residency programs. Participants Family medicine residency program directors. Main outcome measures Program characteristics, current HBPC training, barriers and enablers to training, and program directors’ attitudes toward training. Results There was a 76% response rate (13 of 17 program directors). Respondents’ programs ranged in size from 75 to 300 residents (median 160) and closely reflected actual resident distribution of family medicine residents in Canada. Twelve of the 13 programs offered HBPC training including home visit experiences. Six programs had HBPC-related didactic lectures. None of the respondents had a formal program-wide clinical home visit curriculum, and HBPC training availability and requirements varied across programs. The most frequently cited barriers included logistical constraints, limited faculty availability, and safety concerns. Program directors generally agreed that HBPC training is essential to family medicine training, that it provides valuable learning experiences for family medicine residents, and that it effectively prepares residents in core family medicine competencies. None thought that HBPC training was too difficult to coordinate or that its barriers outweighed its educational benefits. Conclusion There is increasing need for HBPC delivery in Canada, and program directors agree that HBPC training is important and worthwhile. However, barriers exist. Current HBPC training in Canada varies in its availability and requirements, and structured program-wide home visit curricula are absent. We recommend development of a central framework for a structured HBPC curriculum that is competency-based and adaptable. A few small Canadian HBPC training programs have been previously described.6,8 However, there is a paucity of data regarding how most Canadian family medicine residents are trained to provide HBPC. Our survey addressed 2 research questions: What proportion of Canadian family medicine residencies offer HBPC training? and How are residents trained in HBPC? In February 2016, all 17 Canadian postgraduate family medicine residency program directors were e-mailed an invitation to participate in an online survey. Reminder e-mails were sent in accordance with the Dillman approach.9 Participants were eligible to participate in a draw for 2 $50 gift certificates after completion of the survey. The survey was developed based on relevant research studies from the literature10–13 and extended to include additional questions of interest. The project and survey were approved by the University of Toronto Research Ethics Board. The survey collected data as outlined in Table 1. Data collection concluded in April 2016. Descriptive statistics (mean, median, and range for numerical measures; counts and percentages for nominal measures) were generated to describe the results. Answers to open-ended text questions were summarized, and common themes were reported. There was a 76% (13 of 17) response rate. Median (range) program size was 160 (75 to 300) residents. Respondents’ and nonrespondents’ geographic distribution is summarized in Table 2. Respondents represented 2083 family medicine residents. Figure 1 compares the geographic distribution of family medicine residents represented in the survey with the actual resident population in 2015–2016, indicating a fairly representative geographic sample. Analysis of programs’ regional focus revealed a mean (range) training distribution of 50% (25% to 100%) urban, 23% (0% to 40%) suburban, and 27% (0% to 75%) rural. In one program, 25% of residents were in northern remote areas. No associations were observed between programs’ regional focus and availability of or requirement for HBPC training, or program directors’ attitudes toward training. 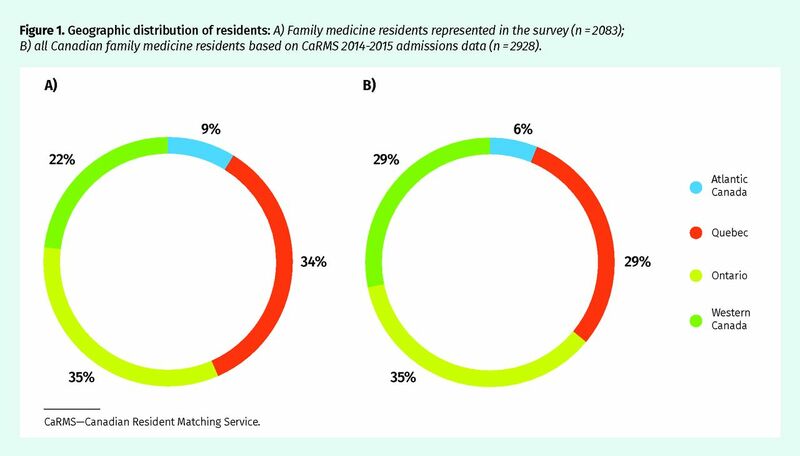 Geographic distribution of residents: A) Family medicine residents represented in the survey (n = 2083); B) all Canadian family medicine residents based on CaRMS 2014–2015 admissions data (n = 2928). All Canadian family medicine programs, with the exception of 1 in Ontario, provided some form of HBPC training including home visits or lectures (Figure 2). Training was not universally available across all programs’ teaching sites. FM—family medicine, HBPC—home-based primary care. Of the 6 programs with lecture-based training, cumulative lecture duration ranged from 1 to 2 hours. Lectures were delivered during family medicine rotations (4 of 6), geriatric or palliative care rotations (1 of 6), or designated academic teaching periods (3 of 6). Respondents could select multiple applicable rotations. Table 3 displays the regional comparison of home visit training availability and requirements for the 12 programs that offered such training. For the 5 programs with mandatory clinical training, there was a median (range) of 5 (0 to 24) minimum required hours per resident. Respondents reported that most residents exceeded this with a median (range) of 10 (0 to 36) hours completed per resident. Only 2 programs had a formal clinical curriculum, as compared with informal planning between residents and preceptors. However, these curricula were available at only select sites of their program. None of the programs had an overarching clinical curriculum applied across all sites. 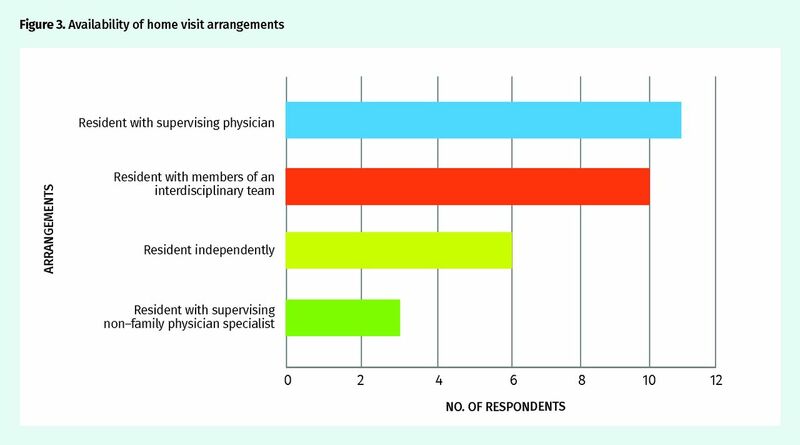 Program directors were asked which members of the health care team attended home visits and could select as many options as applied (Figure 3). Notably, 6 programs allowed residents to perform home visits independently. Although Figure 3 reflects the availability of various home visit attendee combinations, it does not reflect the frequency of visits performed in each arrangement. For example, a program might have 2 arrangements available, where the resident attends the initial visit with a supervisor and subsequent visits independently. Program directors were asked about the barriers to HBPC training that their program had experienced (Figure 4). A number of examples were presented, and program directors selected as many as applied. There was also an option to add free-text responses. Respondents reported a median (range) of 2 (0 to 4) barriers. Additional themes from free-text responses. Rarely can our faculty schedule the home visits around the residents’ schedule—it is done around the patients’ and preceptors’ schedule so if the resident is available … they join our preceptors, otherwise they miss out. Our residents have home care patients and they have scheduled visits with them during family medicine months. However, these visits do not necessarily coincide with moments of patient need, yet developing a program for residents to respond in a timely fashion to home care problems has been logistically extremely difficult. Where the supervision is not physician led, residents often find these experiences low value. This is frequently because of a lack of understanding of the role of a resident by the team members or lack of continuity with the patient, leading to a more “tourist” experience. Where home visits are part of a preceptor’s usual practice, modeling takes care of much of the barriers. Participation may be greatest in [a] rural program, northern remote stream (First Nations and Inuit settings), and while on Palliative Care rotations. Otherwise [HBPC training is] principally “opportunistic” rather than intentional. Program directors rated their agreement with the presented statements on a 5-point Likert scale. Ten of the 13 respondents participated in the attitude ratings. No program directors indicated that HBPC training was too difficult to coordinate or implement and that its barriers outweighed its educational benefits (Figure 6). Nine program directors agreed that HBPC training was an essential part of family medicine training and that home visits effectively prepare residents in the core family medicine competencies (Figure 7). All 10 program directors agreed that HBPC home visit experiences are valuable learning experiences for family medicine residents (Figure 7). Our results indicate that by far most Canadian programs offer HBPC training to at least a subset of their residents in the form of home visit experiences. Half of the programs supplement home visits with HBPC-related lectures. However, there is a range of training availability and requirements across Canada. At this time, the minimum requirement to achieve competency in HBPC is unknown. Notably, although some residency programs mandate that residents participate in home visits, none had a formal program-wide home visit curriculum in place to standardize clinical training across all training sites. Family medicine program directors were largely in agreement that HBPC training is an essential part of family medicine training and that home visits are valuable learning experiences for residents that effectively prepare them in core family medicine competencies. Despite program directors’ generally positive attitudes toward HBPC training, programs faced barriers to implementation—the most frequently cited being logistical constraints and limited faculty availability. Other barriers included safety concerns, limited faculty expertise, limited student interest, limited program focus, funding limitations, and a lack of appropriate patients. The limited educational value of a nonphysician-led experience was also brought to light. It is likely that these barriers, as well as the availability of key enablers such as faculty champions and resident interest, vary between sites and might pose additional challenges to implementing a program-wide HBPC curriculum. Despite encountering multiple barriers to training, no program directors thought that these difficulties exceeded the educational benefits of providing HBPC training. This study is limited by self-selection bias. As a result of unique circumstances, one respondent solely represented the urban stream of the program. Also, it is uncertain how accurately the high-level responses from program directors reflect the on-the-ground HBPC training experience for residents. For simplicity, our study did not distinguish between the type of home visit experience residents received (eg, episodic housecalls vs ongoing, comprehensive home-based care), and thus residents might receive very different home visit experiences. Finally, our study did not determine in which clinical rotation residents obtained their home visit experiences. However, by far most respondents stated that residents attended home visits with a supervising family physician as opposed to another specialist physician. Given the heterogeneity of HBPC training across Canada, we recommend development and dissemination of a framework for a structured HBPC curriculum to bolster consistent standards in resident training. Such a curriculum might outline and address specific HBPC competencies, be built on input from key stakeholders, and be adaptable to individual sites’ needs and resources. A tool kit for HBPC implementation and practice could also be developed. Programs with limited faculty availability might benefit from active recruitment of faculty members who can champion an HBPC program and model HBPC in realistic and sustainable ways. Further, HBPC-focused electives might increase accessibility of training for interested residents. Future research topics include the effects of regional distribution (eg, urban, suburban, and rural) on HBPC training. Additionally, research into a potential relationship between province-specific physician remuneration, home visit prevalence, and HBPC training might be of interest, as clinical training was more widely available in Quebec and Ontario, and clinical experiences were mandatory in all 3 Quebec programs that responded. Finally, a qualitative study of program directors and educators regarding the minimum requirements to attain competency in HBPC and enablers and barriers to teaching HBPC competencies could provide valuable insight. Given the ongoing trajectory of Canada’s aging population, there will be increasing need for primary care delivery in the home. While Canadian family medicine program directors generally agree that HBPC training is important and worthwhile, several barriers to providing HBPC training exist. At this time, training across Canada varies widely in its availability and educational requirements. Further research into the effects of larger health system influences on HBPC training is recommended. Additionally, development of a central framework for a structured competency-based HBPC curriculum, as well as a tool kit for HBPC implementation and practice, is recommended to promote and strengthen HBPC training across Canada. We thank Dr Mark Nowaczynski for inspiring this research study and Dr Alan Monavvari for his support through the research process. ▸ As Canada’s population ages there will be increasing need for primary care delivery in the home, and competence in providing care in patients’ homes is mandated in the College of Family Physicians of Canada’s residency accreditation standards. This survey of family medicine program directors aimed to assess if and how family medicine residents are trained to provide home-based primary care (HBPC), as well as the barriers to and enablers of such training. ▸ The authors found that most Canadian programs offer HBPC training to at least a subset of their residents in the form of home visit experiences. Half of the responding programs supplement home visits with HBPC-related lectures. Although some residency programs mandate that residents participate in home visits, none has a formal program-wide home visit curriculum in place to standardize clinical training across training sites. ▸ Despite program directors’ positive attitudes toward HBPC training, programs faced barriers to implementation including logistical constraints, safety concerns, a lack of appropriate patients, and limited faculty availability and expertise, student interest, program focus, and funding. The key enablers included faculty champions and resident interest. ▸ Avec le vieillissement de la population canadienne, il sera de plus en plus nécessaire de dispenser des soins primaires à domicile, et la compétence pour ce type de service relève des normes relatives à l’agrément des programmes de résidence du Collège des médecins de famille du Canada. Cette enquête auprès de directeurs de programmes de médecine familiale voulait déterminer si l’on formait les résidents à fournir des soins primaires à domicile (SPAD) et si oui, de quelle façon, en plus d’identifier les facteurs qui favorisent une telle formation ou qui y font obstacle. ▸ Les auteurs ont constaté que la plupart des programmes canadiens offrent une formation sur les SPAD à certains de leurs résidents, sous la forme d’expériences de visites à domicile. La moitié des programmes participants complètent leurs programmes par des lectures sur les SPAD. Bien que certains programmes exigent que les résidents participent à des visites à domicile, aucun ne possède un curriculum formel, à l’échelle du programme, concernant les visites à domicile de façon à standardiser la formation clinique dans tous les sites de formation. ▸ Même si les directeurs de programme manifestaient une attitude positive à l’égard d’une formation sur les SPAD, certains facteurs faisaient obstacle à la mise en place d’un tel curriculum, notamment des contraintes logistiques, des préoccupations relatives à la sécurité, le peu de patients appropriés, de même que le peu de professeurs et d’expertise disponibles, d’intérêt de la part des étudiants, de programmes spécifiques et de financement. Parmi les facteurs facilitants, mentionnons les défenseurs de la formation au sein de la faculté et l’intérêt des résidents. Dr Mui was responsible for study design, as well as data collection, analysis, and interpretation, and drafted and approved the final version of the manuscript. Dr Pham was responsible for study conception and design, article revision, and final approval of the manuscript. Dr McMurren was responsible for study conception and design, data interpretation, article revision, and final approval of the manuscript.
. Back to the future: home-based primary care for older homebound Canadians. Part 1: where we are now. Can Fam Physician 2013;59:237-40. (Eng), e120–4 (Fr).
. A curriculum to teach internal medicine residents to perform house calls for older adults. J Am Geriatr Soc 2007;55(8):1287-94.
. Specific standards for family medicine residency programs accredited by the College of Family Physicians of Canada. The red book. Mississauga, ON: College of Family Physicians of Canada; 2016. Available from: www.cfpc.ca/uploadedFiles/Red%20Book%20English.pdf. Accessed 2018 Oct 10.
. Educational outcomes from a novel house call curriculum for internal medicine residents: report of a 3-year experience. J Am Geriatr Soc 2011;59(7):1340-9. Epub 2011 Jun 30.
. There’s no place like home: evaluating family medicine residents’ training in home care. Home Health Care Serv Q 2002;21(2):1-17.
. Home visits in family medicine residency. Evaluation of 8 years of a training program. Can Fam Physician 2015;61:e189-95. Available from: www.cfp.ca/content/cfp/61/4/e189.full.pdf. Accessed 2018 Oct 10.
. National Physician Survey, 2012. Results for family medicine residents. Mississauga, ON: College of Family Physicians of Canada; 2012. Available from: nationalphysiciansurvey.ca/wp-content/uploads/2013/02/2012-FM-Res-Q4b-EN.pdf. Accessed 2018 Oct 17.
. Teaching home care to family medicine residents. Can Fam Physician 1996;42:281-6.
. The Dillman total design survey method. Can Fam Physician 1986;32:2366-8.
. Home care training in internal medicine residencies: a national survey. Acad Med 2001;76(2):181-3.
. Family medicine home visit programs in U.S. and Canadian medical schools. J Med Educ 1983;58(12):934-40.
. The state of community medicine training in family practice residency programs. Fam Med 2002;34(3):177-82.
. Family home assessment in family practice residency programs. J Fam Pract 1981;13(2):217-21.